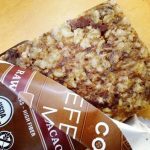 Last week, I shared a recipe for uber-customizable vegan granola bars, and I also reviewed the new Vega One bars, which we all agreed are tasty/nutritious but super pricey, too. 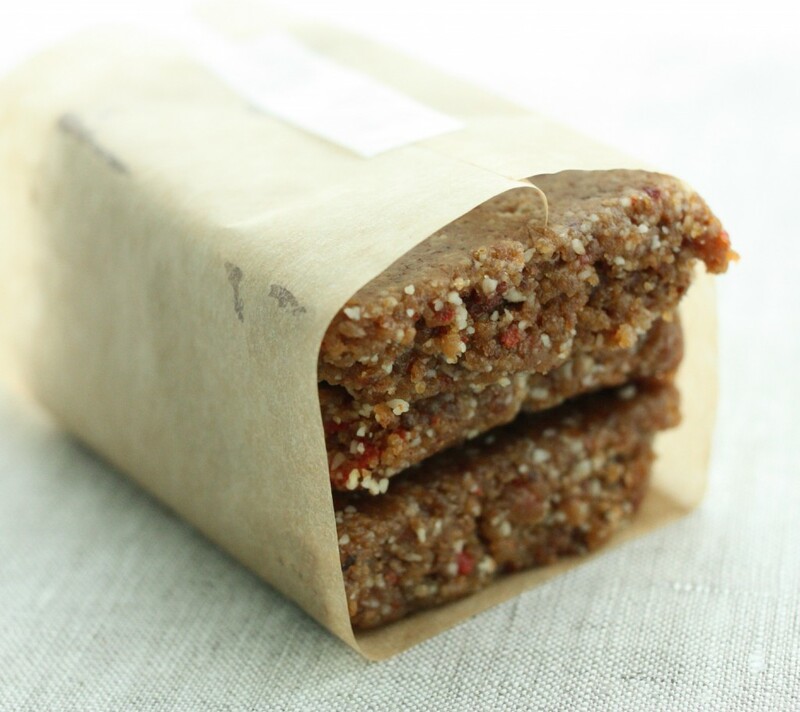 This led one of my readers, Ali, to ask whether I have a homemade protein bar recipe? At that time, I didn’t. A week later, I’m pleased to say that, while I don’t quite have a protein bar recipe, I do have a higher protein bar recipe — a spin on my standard date/nut bars, but with the addition of some brown rice protein. They’re easy, fast, and they provide about 10 grams of protein per bar. That’s not quite as high as a lot of commercial proteins, but it’s a little more than my norm! 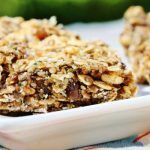 To make these bars, I used plain Sun Warrior protein powder. I like this brown rice protein because I find it less “chalky” than some other brown rice proteins, because each bag has 47 servings, which at $42.99 on Vitacost is a good deal, and because an unflavored version is offered, which means no stevia aftertaste. But you could use any brown rice protein that you like instead; the Nutribiotic brand is a cheaper option, especially when you buy it on Vitacost (which, as you can see, is a favorite shopping destination of mine!). Like all of my snack bars, these guys are highly customizable. If you hate dates, you can use raisins. If you’re allergic to almonds, try them with cashews, Brazil nuts, or pumpkin seeds. Get creative, and have fun! 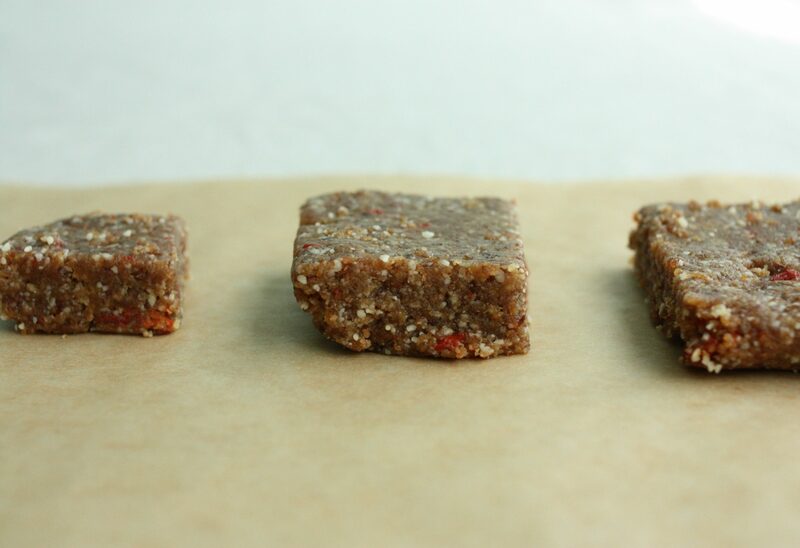 At the end of the recipe, I pulsed in 1/4 cup goji berries. Raisins, cranberries, apricots, or any dried fruit would be nice, too. It’s also worth saying that I cut the bars into a variety of sizes. See? A size for everyone and every time of day! Had I added another scoop of protein, these guys would be even more protein-rich. But three scoops was the right amount in terms of texture and avoiding that chalky taste. 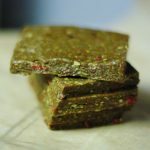 My next experiment will be a bar with hemp protein. And more ideas will probably follow, so stay tuned 🙂 I hope you enjoy these! In a food processor fitted with the "S" blade, process almonds and sea salt till they're ground into a coarse meal (but no giant chunks of almonds left). Add the dates. Give the mixture a few pulses to combine. Then run the motor until the whole mixture is very well ground, and sticks together when you squeeze a handful. Add the dates and the almond butter, and continue to process for a minute or two. Pulse in the dried fruit. If you use gojis, they can be hard, so you may need to run the motor a little. Press the "dough" into a small rectangular baking pan (I used 11 x 7 x 2 inches) that has been lined with parchment paper. Make sure the top is even as you press. Let sit in a cool place for a little while (the fridge is good). 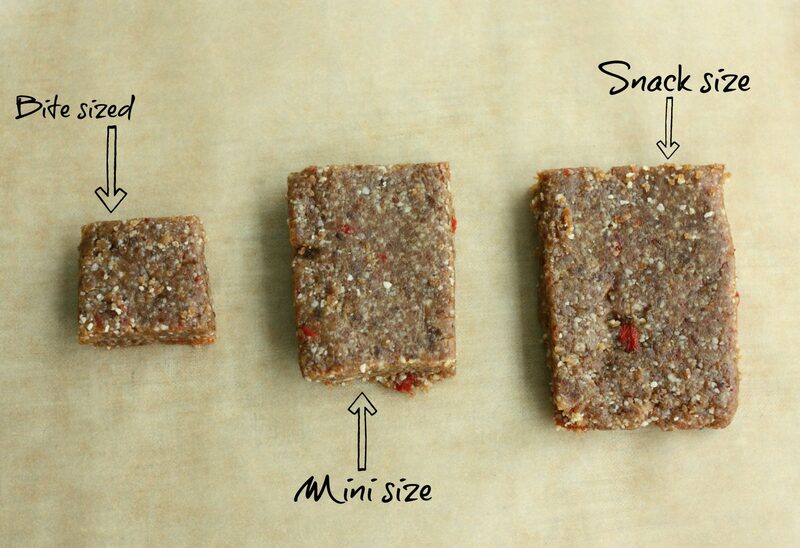 Cut into bar shapes that fit your needs, and enjoy. Makes approximately 10-15 bars. 1. If you use a vanilla flavored protein powder, that's totally fine, but the taste will be quite sweet. You can try omitting some of the dates (maybe a half cup) and adding more almond butter to bind (maybe 2-3 tbsp), though I haven't yet tried this method. 2. Feel free to chop in cacao nibs, to add vanilla extract, or any other add-ins you like (maca, cinnamon, cocoa powder). 3. Hemp protein should also work well! But as I wait, I wanted to draw your attention to a new program from Nutritionista Meghan Telpner (whose fabulous UnDiet was reviewed here a few weeks ago). Meghan has a new Culinary Nutrition Expert certification program. It’s a deep immersion in plant-based food prep (including raw foods), as well as nutrition. The program both teaches you how to prepare a lot of incredible food yourself, and it also teaches you how to coach others in plant-based food prep. With this certification, you can go on to do menu planning, lead cooking classes, and help others maximize the quality of their food. It’s an ideal culinary training for people who already have health education (holistic health coaches, nutritionists, RDs, herbalists) but want more thorough experience with the culinary arts, or people who are looking to have careers in catering, cooking classes, or menu planning with a whole foods slant. I get a ton of emails asking me which program I recommend for nutrition work. My answer is that, if you want to do nutrition work full time, for the long haul, I recommend going for the RD. The education will greatly enrich your perspective on health, and you’ll have a wide variety of career options at your disposal. If, however, you’re looking for a more flexible career that is focused primarily on culinary arts (and helping others to master them), this course is an amazing option. Meghan has tremendous culinary experience, as well as a refreshing and wholesome outlook on body, health, and just about everything! Best of all, you can complete the program online–which means you can work from home as you go through it. When you browse the CNE website, you’ll be able to see testimonials from her graduates, in addition to all of the details. Check out the details here–you can definitely reach out to Meghan’s team with questions. Also, if you have any questions about the program that you’d like to run by me, please feel free; I’m pretty well acquainted with a number of available culinary and nutrition programs, and I’d be happy to offer feedback. 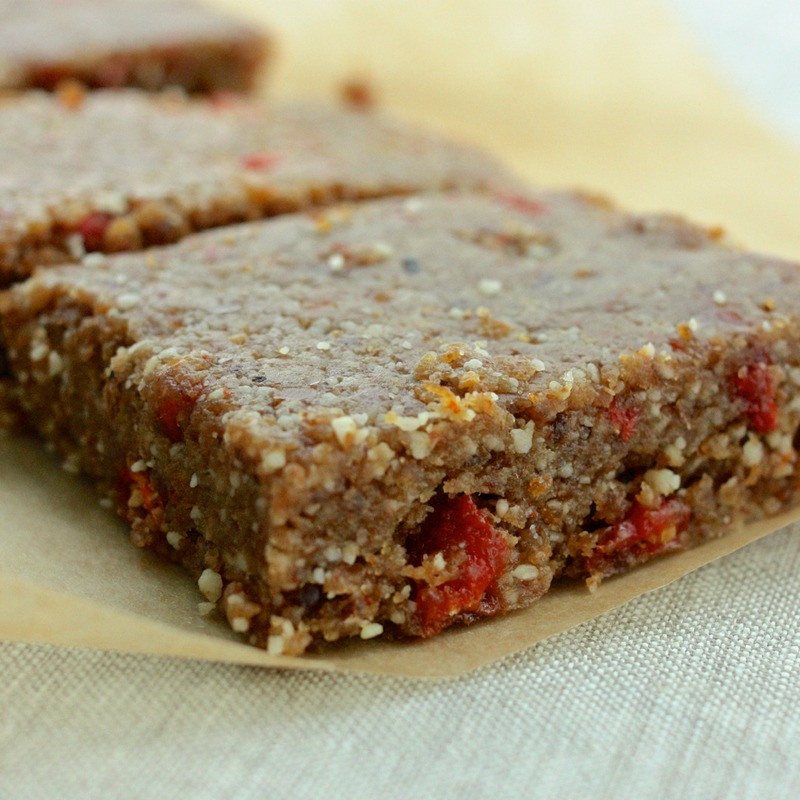 Almond, Oat, and Goji Berry Protein Bars: Vitamix Snack Bar Success! Plus, Reader Feedback Requested. 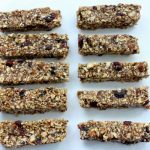 Product Review: Core Foods Defender Meal Bars. Plus, Some Thoughts on Meal Replacement vs. Snacking. I found they were better before dehydration, though, so that is completely optional. I love your photos Gena! Those look great! I’ll definitely sub in brazil or cashew nuts for the almonds, and pumpkin or sunflower seed butter. yum! Great recommendation for Meghan’s CNE program. I’m registered for it and cannot wait to get started in the fall! So jealous! Wish I was at Vida Vegan Con, too – have a blast! I bet these were a nice traveling snack. These remind me of Picky Bars, which I copy-cated this week using their label. 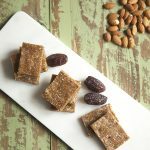 They use brown rice protein and crispy brown rice cereal, which adds an awesome crunch. They came out so good that I will be adding brown rice protein to my date bars more in the future! Have you ever tried pea protein? It is higher in the protein content and it doesn’t have the chalky taste. These look so good! Can’t wait to get back into my kitchen after Step 1 studying is over! Congrats on the MCAT btw and good luck with applications! That program sounds really amazing. It’s funny that you gave a little bit of career advice today, because I’m just beginning my career in fitness/nutrition/health and I’m desperately seeking guidance. Nutrition is such a passion of mine, but there are so many different ways to go about finding a career in that field. It’s overwhelming! I want to become a wellness coach one day, and I have no idea which programs I should be devoting my time to. You’re definitely an inspiration! Your bars look perfect! Sounds delicious as well 🙂 Love your blog girl! I feel famous now having been called out on your blog, Gena! 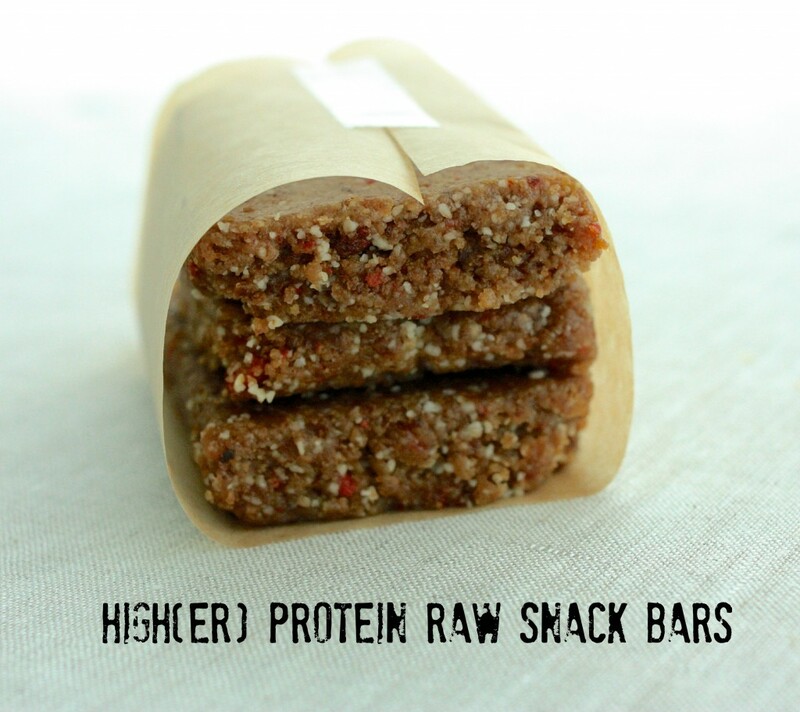 These look terrific,10g of protein sounds just fine to me,and I love that they’re customizable. I will be making some this weekend,since it doesn’t look like outdoor activities are in store. Hope you don’t get too drenched during your visit. These look awesome, and perfect for my on the go lifestyle! Will be making soon. Thanks for sharing Gena! I wonder what you could sub for the protein powder? Do you think brown rice flour or coconut flour would work? I wouldn’t use flour, Annette — I’d just leave the protein powder out! Do you have any recommendations for a substitution for the almonds? I am allergic..I can eat cashews and sunflower seeds. Cashews will work really well, Stephenie. These look like an awesome addition to my lunchbox. Thanks for this easy recipe, Gena! I’m so looking forward to trying these. I’ve already shared them on my FB page, as I know alot of my peeps will love them. Thanks for sharing! These look so great and super healthy! I also love that there is no packaging- they are good for the environment as well! I’m hoping that you can help me with a question I have regarding arsenic in brown rice protein powder. I don’t know if you remember, but, about a year ago there was a big brouhaha over arsenic levels found in rice, specifically brown. I’ve written both Garden of Life AND Sunwarrior asking about whether they test their protein powders for arsenic or if they undergo any kind of purification. Neither ever responded, which does NOT instill any sense of confidence in me whatsoever. I thought maybe you would be more “in the know” about this matter than I. Do you know if any studies have been done testing for arsenic in brown rice protein powders? Based on your nutritional and medical schooling, would ithe arsenic be more or less concentrated than in whole grain form? Do you know if the companies filter or “purify” their brown rice protein products? I’ve known the company for six years now and can tell you that I personally have faith in their methods, but of course I urge you to draw your own conclusions, chat with your health care provider, and do what you need to do to feel secure. There’s always hemp & pea protein, too! Thanks so much for the quick response. 🙂 Coincidentally, SunWarrior got back to me just 1-2 hours after your response with the same information. I appreciate your input on the matter, nonetheless. Interesting you note the “chalkiness” of the brown rice protein. I noticed it too. I buy Heartland brand. Honestly, that’s why I do not use it in baking protein powder desserts and I make a lot fo them. My skin doesn’t do well with whey protein, I get acne and I want to bake with vegetarian protein powder. 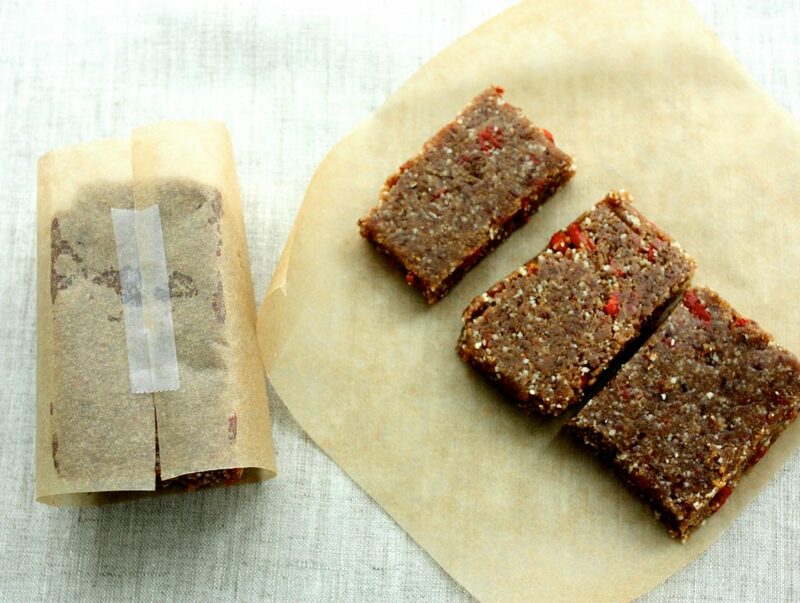 Have you tried baking with hemp or pea protein powder? I would appreciate your input. Oh boy. Have fun with dates or raisins. Or almonds or cashews. The only people these would taste good to, are people who have forgotten what real food tastes like. Nice! I think I’ll sub my ‘tonic’ powder mix (spirulina, chlorella, nettles, maca and cinnamon) instead of protein powder and see how that fares. Looks delicious. Ok. That was fast. I made it with pecans instead of almonds since they grow here (down south) and it’s delicious! I added my tonic powder + hawthorn powder since I’ve been working with it lately and some coconut instead of dried fruit. I had to add a teeny bit of coconut oil because it was really crumbly, but that was an easy fix to achieve perfection. I was wondering what the significance of adding chocolate brown rice powder instead of vanilla or plain? I can’t stand vanilla and for the most part I have more uses for chocolate protein powder.I’m a newcomer to the vegan (and protein powder) life style, so any tips would be great! and everything. Nevertheless think about if you added some great graphics or video clips to give your posts more, “pop”! I followed this recipe exactly and for some reason it came out kind of dry. It broke apart easily. It tasted good.. but it didn’t come out as moist as in the photo. 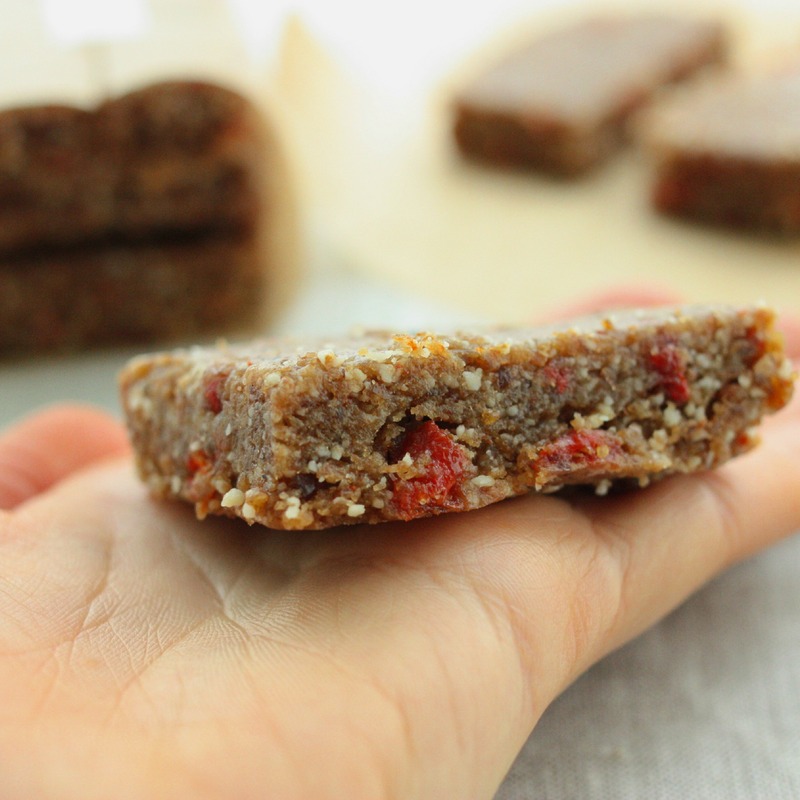 I used very moist goji berries and dates. I guess it could be the sun warrior protein powder? I look forward to trying these. I apologize, but did I miss the nutrition information on these? What is the protein on these?